I had the special opportunity to attend an agave pit roast this past first week of May which was put on by the Coconino National Forest (assisted by volunteers from our local chapter of the Arizona Archaeological Society) at a rock art site south of Sedona. This is a several day process that starts with digging out the pit, gathering firewood, harvesting ripe agaves which can weigh over 100 pounds each. We gathered in a meadow near Beaver Creek on a warm sunny spring day and I quickly became immersed in the sense of community and joy of being outdoors together for a special occasion. It takes a community to do these gatherings. To the Yavapai and Apache people, agave is life–a food with a spiritual meaning and a cultural identifying quality. In centuries past it was a nutritious, sweet food they savored and part of the year round cycle of harvesting the land. Apaches, as with other Native peoples, bring thankfulness, prayers, blessings, songs, dances and laughter to these gatherings surrounding the preparing and sharing of indigenous foods. Here in the Verde Valley area, the traditional life of the Tonto Apache and Yavapai peoples was disrupted by the coming of the Americans in the 1860’s. Interestingly, a revival of this tradition locally was stimulated by archaeological studies of prehistoric roasting pits that have been found at Sinagua (Prehistoric Puebloan) and Apache sites throughout the region. The fire at our gathering was started with a bow drill the old-fashioned way and tended while it burned down to coals. Agave hearts were laid on top of the coals covered with wet burlap (wild grasses would have been used centuries past), then covered with mounded dirt and another fire lit on top for a few hours. For four days it simmered in the underground oven. When we opened the pit on day 4, it was still warm and the agave was tender and delicious with a flavor between sweet potato, molasses and pineapple. The taste took me back in time and connected me to this wild plant in a new and special way. Recent tests by New Mexico State University found that dried mescal leaves contain 85% soluble carbohydrates, 1% protein and 14% insoluble fiber and are roughly equivalent in food value to oats. The dried mescal had the added advantage of being easily stored over long periods of time. In my almost three decades of hanging out with Native peoples, I recall so many times noticing how nurtured I felt by indigenous cooking. The foods are grown or harvested with gratitude and caring so the foods seem more alive. Not only are the simple foods of the land wholesome and delicious, but the ladies put a lot of joy and blessing into it that make me hum inside with a sense of well being. Apache women trek across a hillside to the agave field. In this series of early 1900s photos by Edward S. Curtis, Apache women are shown harvesting and processing mescal, or agave, for food. Photos from the National Anthropological Archives, Smithsonian Institution. 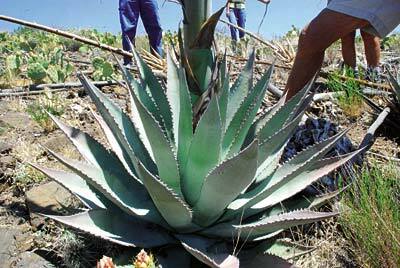 Agave is also called mescal, and it is the use of agave that caused the Spanish to give Mescalero Apache their name. Mescaleros live in New Mexico and Texas today. Cutting mescal. To harvest the plant, a woman pounds a sharply pointed wooden digging stick into the plant roots, cutting off the plant at its base. The leaves, stalk, and roots will be trimmed off, leaving the stem base, or heart, of the agave plant. Filling the pit. Apache women load dozens of trimmed agave hearts into an earth oven that has been prepared for the roasting process. Earlier, the women dug a large pit and lined it with flat rocks. A fire was then built on top of the rocks to heat them. Once it died down, a layer of moist grass was laid on top, and the oven was ready to receive the plant bulbs for baking. Once loaded, they will be covered with another layer of grass, followed by layer after layer of dirt. The covered pit. An Apache woman loads a final basketful of dirt over the mound now covering the baking pit. The layers of dirt seal the heat inside the oven in which the plant bulbs will bake for 12 to 24 hours. When the bulbs are removed, they will be fire-blackened, but moist and tender. After drying and cleaning, they will be ready to eat. Agave and other desert plant hearts are high in carbohydrates, providing an important energy food for native peoples over thousands of years. Information in this insert based on University of Texas, Austin website. Remnants of agave gardens have been found in several places in the Verde Valley–they were planted with a handful of species that had been genetically selected for over a long period of time, perhaps in what is now Mexico, and brought to the Verde Valley by traders. Botanist Wendy Hodgson has several reasons to believe that the agave plants she has found in small stands around the valley is the product of human domestication that took place sometime between 1100 and 1400 AD.